The Minister for Social Protection wants to index many social protection payments to a cost of living index as an anti-poverty measure. This makes sense on the face of it, as long as that cost of living index is going up, and as long as the level of benefits fall when the cost of living falls. It’s also worth thinking about the virtues of indexation, as this was one of the main criticisms IFAC had of the fiscal space calculations during the last election. Let’s say you index benefits to the consumer price measure of inflation. Here’s what happened to that reading over the longer run. Just messing about with the idea a little more, imagine we ‘begin’ the Irish economy in year 1 with a CPI reading of 100, and grant benefits of €100. Then we can add in (say) the last 20 years of real CPI data from 1995 to 2015 to get a sense of what would have happened to benefits in a year-on-year basis as a result. The line is the increase in benefits as a result of the indexation, and the bars are the changes in euros to the benefits as a result of the cost of living increase or decrease, measured on the right hand axis. The excel sheet I used to knock this up is here. Hopefully you can see two things. First, the measure is highly pro cyclical. Precisely when we want benefits to decrease a bit, because the economy is growing strongly, they go up, and when we want benefits to increase a bit to cover the cost of living during a crash, they go down. Second, in recent years inflation has either stagnated, or fallen, so you wouldn’t see a huge increase or decrease in benefits either way. Now you could smooth out some of these effects out with a moving average of, say, 3 years, but this little exercise shows, I think, that it’s worth looking carefully at indexation proposals. The Central Bank have released the Q4 2013 update of their mortgage arrears statistics. For Primary Dwelling Houses (PDHs), 12.6 per cent of accounts are in arrears of 90 days or more. This compares to 11.4 per cent of accounts in similar arrears in the unaudited monthly data for December published by the Department of Finance. The Department of Finance figures cover the six banks operating under the Mortgage Arrears Resolution Targets (MART) process. These banks (ACC, AIB, BOI, KBC, PTSB, ULSTER) provide 90 per cent of mortgage lending in Ireland so it is clear that the remaining 10 per cent of mortgages (from the former BOSI and INBS as well as the various sub-prime lenders) have a far higher arrears rate – somewhere around 23.5 per cent. The 90-day arrears rates for the INBS and subprime mortgages are greater than 50 per cent. In today’s Central Bank statistics we see the total number of PDH accounts in arrears continue to fall and for the first time there was a decline in the number of accounts 90 days or more in arrears. However, the situation of those in existing arrears continues to deteriorate with yet another significant increase in the number of accounts now 720 days or more in arrears (31,834 to 33,589). On average the accounts greater than 720 days in arrears are just under €42,000 in arrears. Across the statistics there is an average of roughly 1.25 accounts per household. The outstanding balance on mortgages in arrears fell from €25.6 billion to €24.4 billion of which €18.2 billion are in arrears of 90 days or more. The total amount of arrears rose from €2.17 billion to €2.24 billion. The total amount of PDH mortgage debt continues to fall and is now at €107.4 billion, compared to €118.6 billion when the series began in September 2009. However, it should be noted that the release mentions “asset sales” that took place over the quarter but it is not clear what impact these have on the figures. The sales refer to mortgages that were sold by one of the reporting institutions, and are therefore no longer included in the statistics. At the of December there were 84,053 restructured PDH accounts and 79.3 per cent were deemed to be meeting the conditions of the restructure. 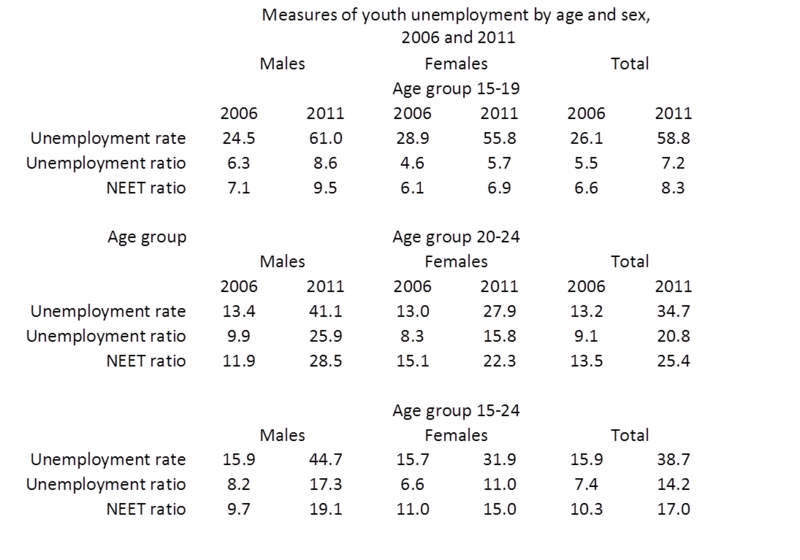 There is a new table providing these rates by each type of restructure. Reduced payment less than interest only (4,264) and arrears capitalisation (18,516 accounts) are the worst performing restructures for PDH accounts. There were only 14 accounts granted a permanent interest rate reduction. There were 63 forced repossession in the quarter and 105 voluntary surrenders. Court proceedings were initiated in 1,491 cases. 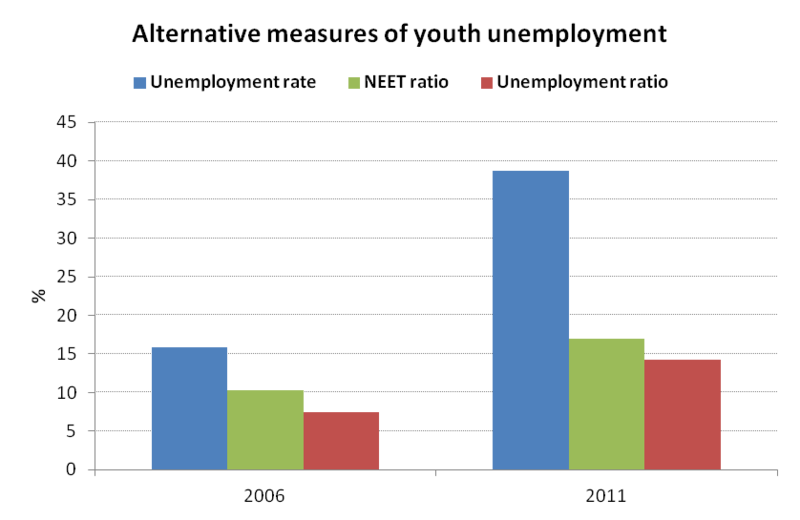 Up to Q2 2013 the average number of proceedings issued per quarter was around 250. 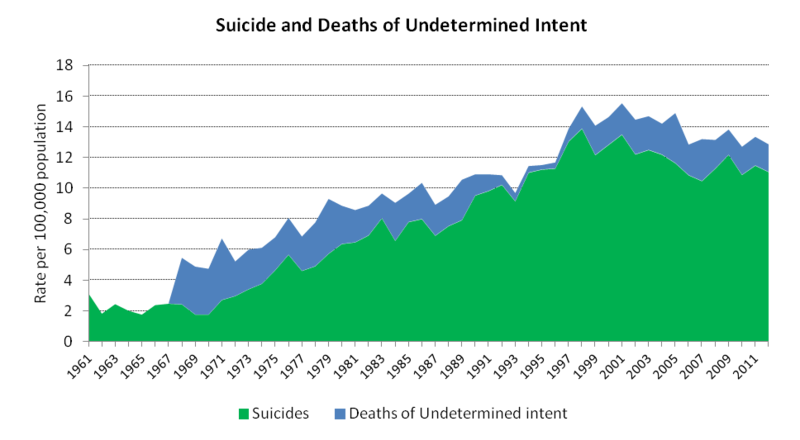 This increased massively in the second half of 2013. During Q4, 258 court proceedings were concluded and 82 court orders for repossession were granted. Of the 176 concluded by other means it is probable that many of these see the borrower and lender enter a new arrangement through a restructuring of the original loan agreement with others ending by way of voluntary surrender/abandonment. Data on the Buy-to-Let sector are also included in both releases. Seán Ó Riain’s post and links to the recent British Medical Journal article on suicide and unemployment call for an extended comment, although, as Brian Lucey points out, the topic was discussed in a recent post. To examine whether suicide rates rose more in countries with worse economic downturns, we used Spearman’s correlation coefficients to investigate the association between suicide rate ratios in 2009 and percentage point changes in unemployment rates between 2007 (the baseline year) and 2009 (unemployment rates (in %) in 2009 minus unemployment rates (in %) in 2007 across study countries. 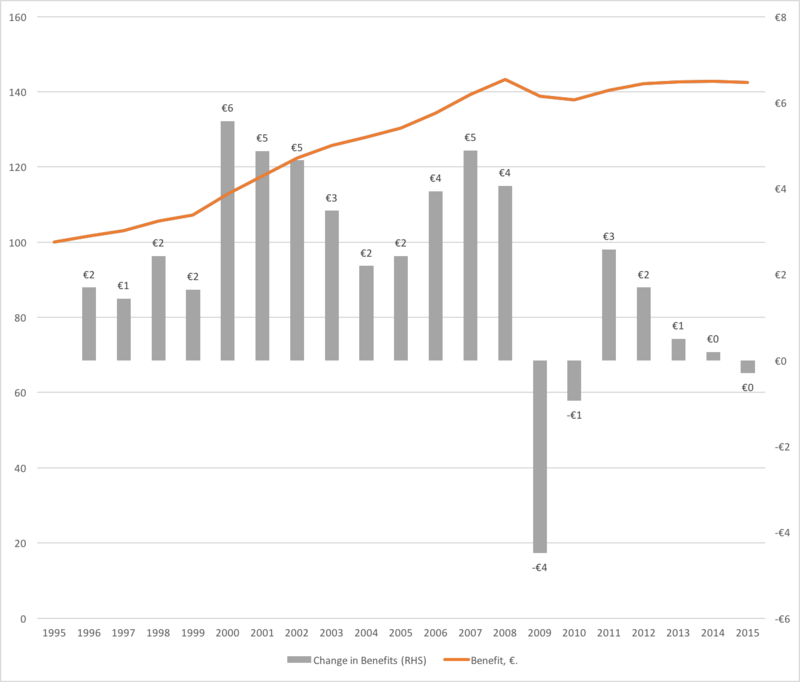 As may be seen from Figure 1 the Irish suicide rate hardly changed between 2007 and 2010 – rising from 10.5 to 10.9 When deaths “due to external causes of undetermined intent” (a category generally viewed as referring predominantly to suicides) are included, the rate actually fell from 13.2 in 2007 to 12.7 in 2010. Looking beyond 2010, using preliminary data based on year of registration, both measures of suicide were stable in 2011 and 2012. 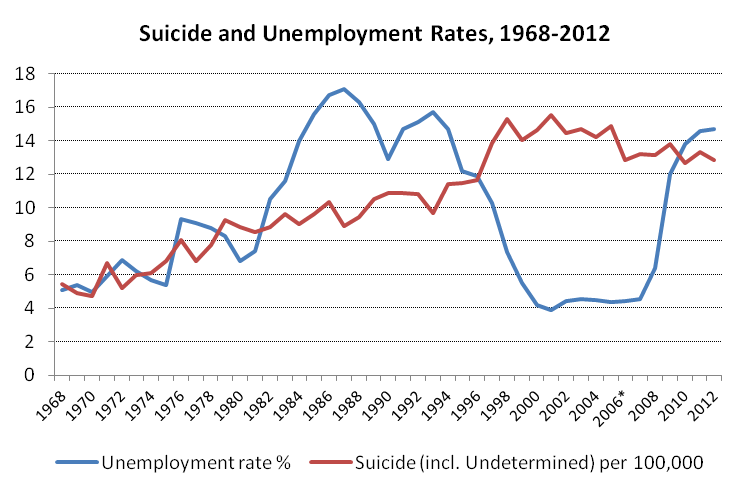 Taking a long-run perspective, the econometric evidence contained in Walsh and Walsh, 2011 shows that the Irish suicide rate has been only weakly correlated with the unemployment rate. Other factors seem to have been at work. For example, the suicide rate rose sharply during the period of falling unemployment in the second half of the 1990s, which coincided with a surge in per capita alcohol consumption. The suicide rate declined during the first half of the noughties – particularly among younger males – coinciding with the start of a steady decline in alcohol consumption. The following Figure shows the suicide and unemployment rates since the 1960s and brings out the lack of correlation between them. In particular, the recent surge in unemployment seems to have had a surprisingly weak impact on the suicide rate. While it might be claimed – as is done in the BMJ article – that had unemployment not risen, the suicide rate would have fallen below its present level, but extending the earlier econometric work down to 2012 suggests that the influence of the unemployment rate on suicides has remained relatively weak and confined to males aged 35-54. These age groups account for about 30% of all suicides. Suicide among males in other age groups and among females, which account for 70% of the total, do not appear to be significantly influenced by the unemployment rate. We must be careful not to attribute too much of our current suicide problem to the downturn in the economy and / or the measures that have been taken to correct our fiscal imbalances. Morgan Kelly’s comments (and research paper) last month on mortgage debt restructuring forced the government to come up with an expert group to recommend solutions to the problem of highly indebted households. The expert group’s report will be presented to Cabinet this week and has helpfully been leaked before that. Today’s Sindo carries a small piece by John Drennan on the content of the ‘Keane’ report that raises more questions than it answers. “Homeowners who can no longer pay the mortgage could negotiate with their lenders to hand back the property but remain on as tenants. Banks who repossess homes will then lease them to local authorities to deal with housing shortages. The timeframe to get discharged from bankruptcy to be cut from up to 20 years to just three years. People facing bankruptcy will be offered a “non-judicial” route — meaning they won’t have to go through the courts in all cases. The most important part of the report is contained in a rather throwaway sentence–that banks “should engage in debt settlement“. The mechanics of this process (or processes) of debt settlement are very important and should be discussed on this blog and others when the full report is eventually published. It looks like the group is taking a multi-pronged approach to the problem, which is welcome. It also looks like there is some attempt to deal with the issue of those who will never pay their mortgages via movements to local authority lists. That is not a simple process either, as NamaWineLake has recently shown. It is important to note the timescales here. Right now, according to the government’s legislative programme, any bill to reform our bankruptcy laws is not even a twinkle in Minister Shatter’s eye, despite his assurances that the personal insolvency legislation would be substantially complete by Christmas or early 2012. That means the lynchpin of the strategy–that people can fail, and fail relatively cheaply through expedited personal insolvency proceedings–will likely not be in place before the summer. Other questions present themselves, such as: when ‘negotiating’ with a bank on whether to hand the house back and/or rent it back again, will there be a code of conduct for these negotiations? Who will decide? Third, the super-MABS body may only have an advisory role, rather than an adjudicatory role in the debt resolution process, meaning that the banks retain most of the power in the debt resolution process. Or not. We just don’t know. The sooner this potentially very important report gets 100% leaked after Cabinet approval, the better. Jacopo Ponticelli and Hans-Joachim Voth have just published a CEPR Discussion Paper looking at the relationship between austerity and social unrest in Europe between 1919 and 2009. Real conservatives have always worried about social cohesion..
..which is why it makes sense that this article should have appeared in the Telegraph rather than the Guardian (HT FT Alphaville). Author Kevin O’RourkePosted on August 9, 2011 August 9, 2011 Categories Fiscal Policy, Political economy, Social conditions41 Comments on Real conservatives have always worried about social cohesion..
Last nights programme on Irish playwriting during bubble and bust was thought-provoking and enjoyable (I’m not sure if the link works outside Ireland). It also gave us a chance to see frequent commentor on this site, Gavin Kostick, in his natural habitat. I love Irish theatre, and the last 10-15 years have given us some fabulous plays. But O’Toole wanted something more: art that engaged with the really big themes in Irish society, a lot of which are, nowadays, economic. I found myself wondering how you would have written a bubble play that would have been more than an unfunny and joyless (Michael Colgan’s phrase) social satire. But surely there are cleavages in Irish society today that are ripe for artistic exploration.